Thank you for checking out the District of Columbia’s web page dedicated to the belief that the nation’s capital should be the safest place possible for children to live. While there are many dangers that can confront us every day, one that is entirely preventable is exposure to lead. 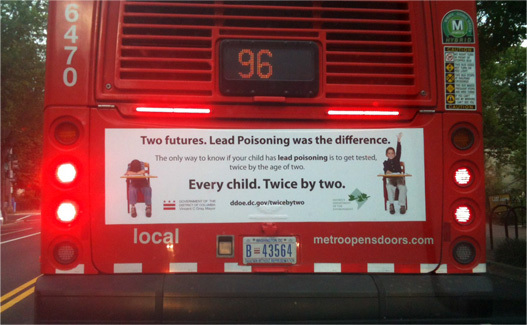 Why Test Your Child for Lead? A simple blood test is the only way to know if your child has been exposed to lead. Please make sure your doctor follows District law, which requires lead testing of all young children at least twice. Ask your doctor to test your child for lead at age 6–14 months, and again at age 22–26 months. An easy way to remember: Test every child, twice by two. Why Test for Lead Twice? Even if a child shows no lead exposure at age 6–14 months, the child must be tested again around the time of their second birthday. There is a simple reason for testing young children at least twice: children are potentially exposed to lead in different ways and at different stages of their development. Children move around a lot more at age two than they do at age one. They can reach more surfaces and grab more objects. Puts non-food items in their mouth on a frequent, regular basis. If you have concerns about your child’s potential exposure to lead at any time, please let your pediatrician know, and request a blood lead test. These tests are required by District law during well-child visits at age 6–14 months and again at age 22–26 months, and if any of the above-described circumstances are occurring. Lead is a highly toxic substance, and its most vulnerable victims are the youngest of our children. That’s because lead attacks the brain and central nervous system, both of which are still under development while children are growing from being an infant to being a toddler and a pre-schooler. By attacking these vital organs at such an early time in a child’s life, lead can cause serious and even permanent harm. IQ deficits, a permanent loss of brain power. Lead can be found in paint, in particular in homes built before 1978, when the use of lead in our house paint was finally banned. Close to 90% of the District’s housing stock was built before 1978. The older the home, the more likely it is to contain lead paint. Lead paint turns into lead dust. Old windows and doors frequently were painted with lead paint, and the grinding of those painted surfaces generates lead dust, which can be very difficult to clean up, but very easy for a child to ingest. Lead can be found on and in toys, whether on exterior paint or on interior toy components, and in particular on and in toys or costume jewelry and other inexpensive items imported from China and a few other countries where lead is not adequately regulated. Lead can be found in dirt, as a result of leaded gas emissions from passing cars, buses and trucks before leaded gas was banned in the US during the 1980s. It can also result from old lead paint falling off the exterior of homes, or as a result of the renovation or demolition of old homes that failed to include safe ways of handling or properly disposing of the old paint. Since lead does not sink deeply in the soil after being deposited there, playing in dirt can cause lead exposure. Lead can still sometimes be found in drinking water. Plenty of old pipes still remain under the District’s streets; and it is still possible for lead to leach into drinking water in some homes, schools, and child development facilities. A variety of District agencies are knowledgeable about and working hard to prevent these various ways a child can be exposed to lead. However, some exposures inevitably continue to occur, and the sooner you as a parent can find out about it, the better for your child. The only way to know if your child is being exposed to lead is to get a blood lead test. How Can Parents Help Prevent Exposure to Lead? If you live in a home built before 1978 that may still have some old paint on some surfaces, make sure the paint is kept in good condition. Paint deterioration probably causes more lead exposure than any other source of lead in the District of Columbia. If you’re a tenant in a pre-1978 home, and you have a child under the age of six who either lives with you or is a frequent visitor, or if you or someone in your household is pregnant, or if you have a pregnant person who is a frequent visitor, ask your landlord for a “clearance report” showing your home is lead safe. It’s your right as a tenant under DC law! If you’re getting maintenance work done on your pre-1978 home, or if you are renovating or remodeling it, make sure the folks doing the work are properly trained to use lead-safe work practices. It’s the law! If you’re not sure about the quality of your drinking water, you can contact DC Water for advice. They also may be able to provide you with free water testing. See www.dcwater.com/lead for more detailed information. If you’re not sure how lead-safe your yard is, it’s best to make sure there is no bare soil around for your child to play with. Cover bare soil by planting grass, bushes, or other ground cover. If you want to make sure your child isn’t playing with a toy known to contain lead, check the US Consumer Product Safety Commission’s website at www.cpsc.gov - the website contains a long list of toys and other items that have been recalled due to lead and other issues. Twice By Two Campaign in Motion. See more Media and Community Outreach efforts.